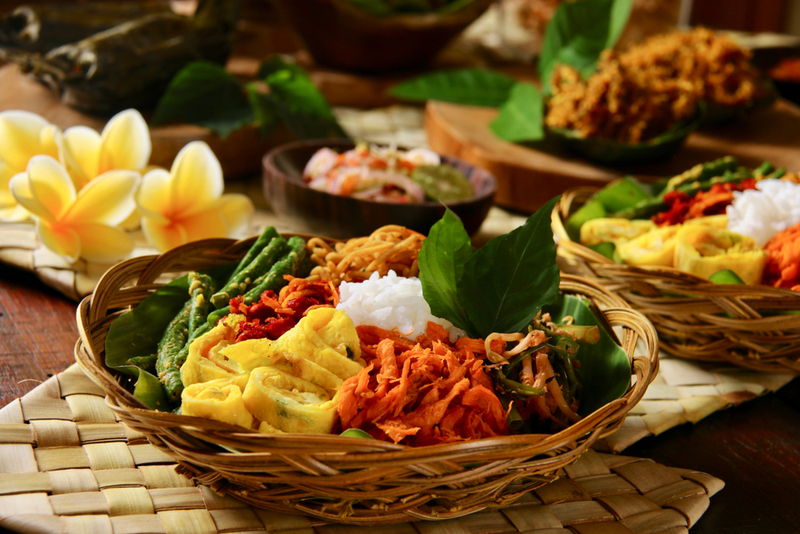 Eat like a local: What are Bali’s most famous traditional dishes and where can you go to sample the best of them? Here are our top tips and tricks for deciphering menus and eating like a local in Bali! Bali has a wide range of dining options to cater to every taste. From fast food to fine dining and everything in between, everyone can find something to suit their taste on the island. 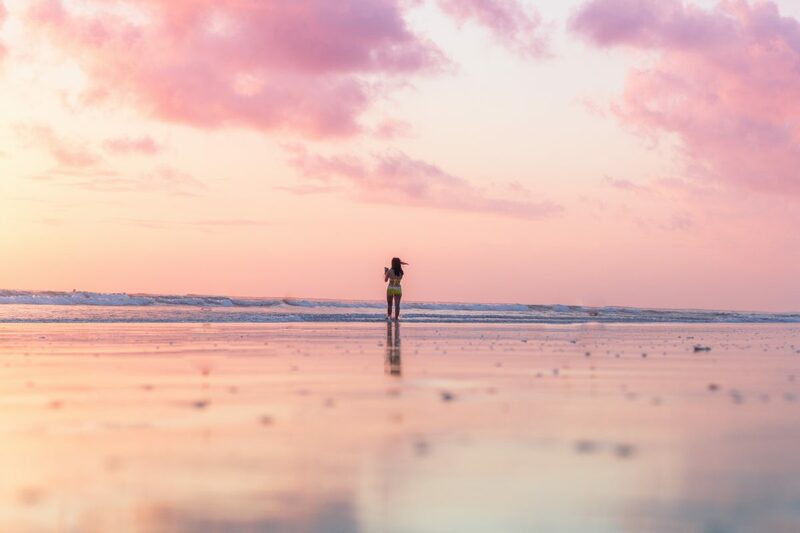 If your goal is to immerse yourself in the culinary culture of Bali, however, the Western-food dominated streets of Bali’s busier areas may seem a little ‘non-authentic.’ Don’t despair, though – there are hundreds of places in Bali where you can try traditional dishes and eat like a local. 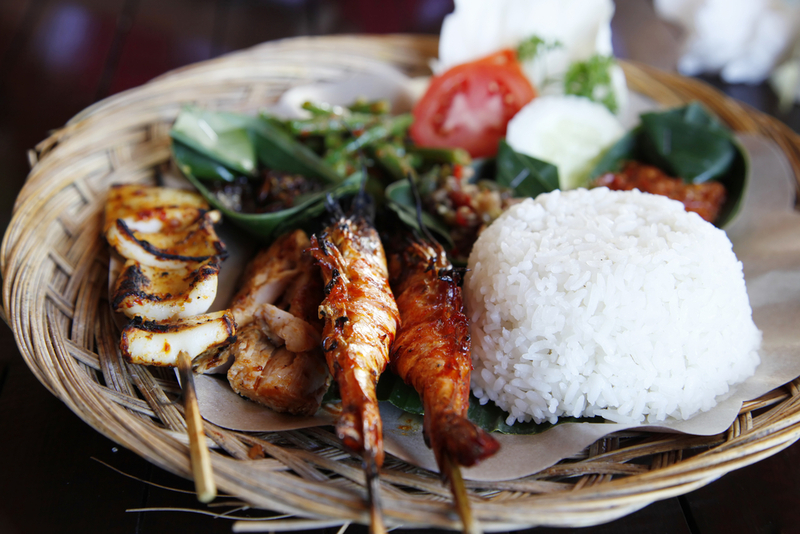 But what are the most unmissable dishes in Bali and what are the best places to try them? Where can you go to eat like a local in Bali? 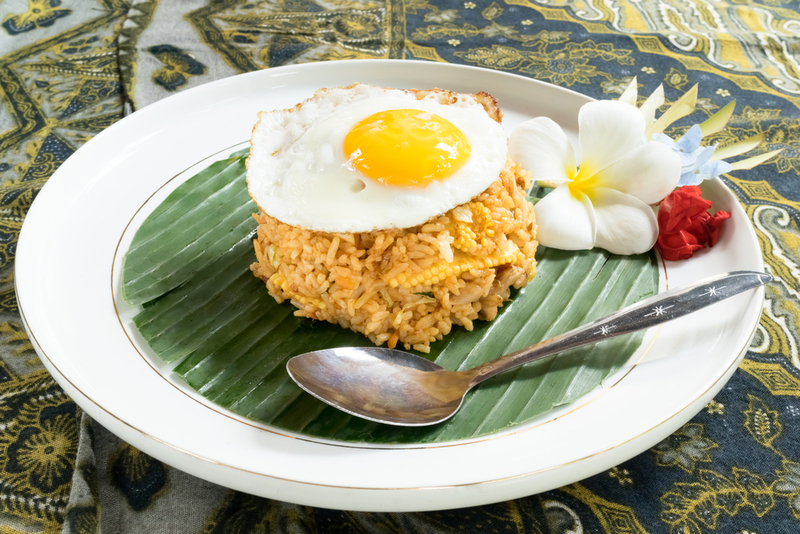 An Indonesian staple, Nasi Goreng can be found all over the island. This simple fried rice dish is often served with vegetables and/or chicken and usually comes with a fried egg on top. Substitute the rice in Nasi Goreng for noodles and you have Mie Goreng! 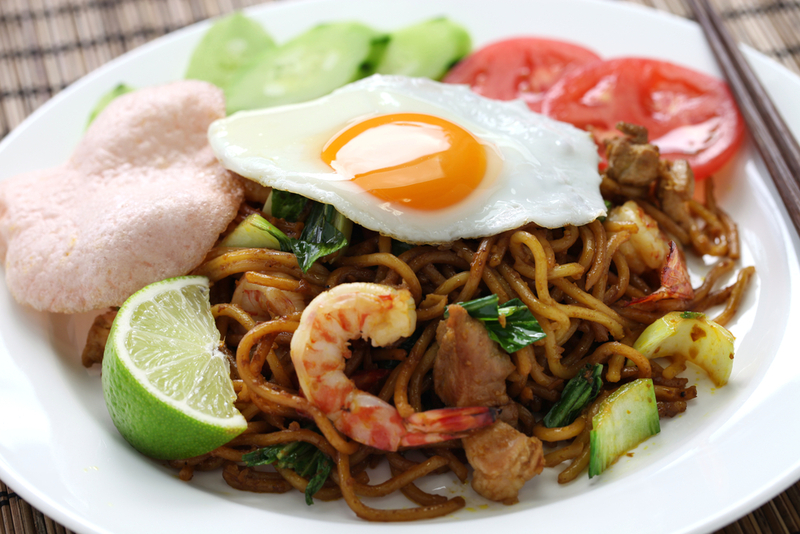 This tasty fried noodle dish is another of the most widely-eaten in Bali and can be found on virtually every menu. Mie Goreng (fried noodles) can be found everywhere in Bali. Campur means ‘mixed,’so Nasi Campur is – you guessed it – mixed rice. The steamed rice is usually served alongside vegetables, chicken or fish or tempeh, accompanied by a dollop of spicy sambal. Gado Gado contains a vibrant mix of seasonal vegetables and, all tossed in a rich, peanut-based salad dressing. This tasty vegetarian dish usually includes boiled egg, tempe, tofu and a side of prawn crackers – perfect for lunch in Bali! 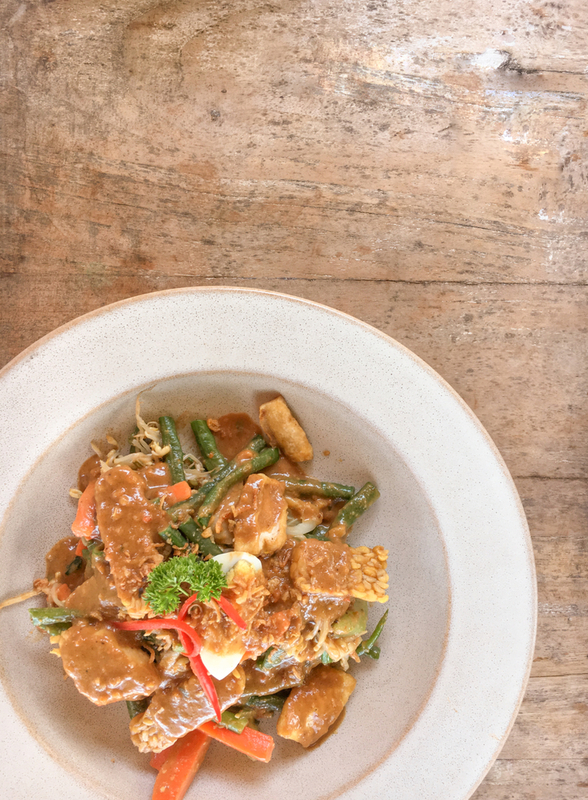 Gado Gado; a mix of seasonal vegetables in a rich peanut sauce. This deliciously rich and spicy curry is a must-try in Bali. 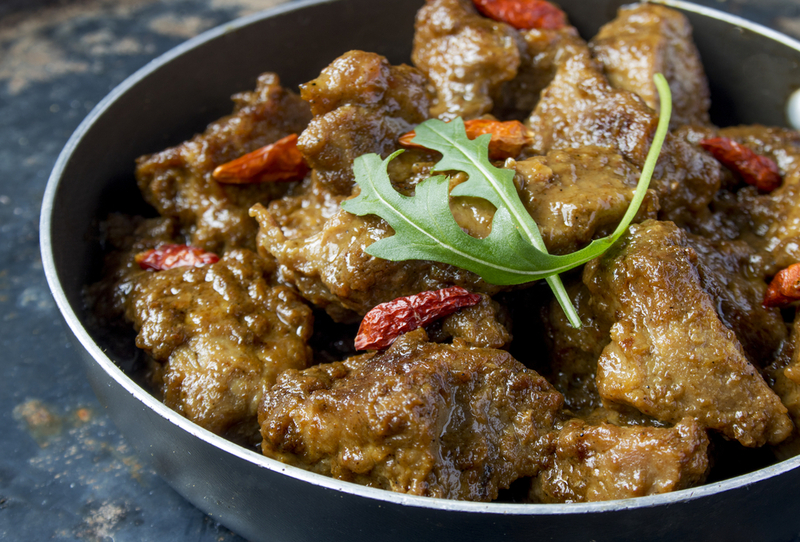 Rendang is traditionally made with beef and is usually enjoyed alongside steamed rice. Deliciously spicy beef Rendang; a must try for travellers in Bali. 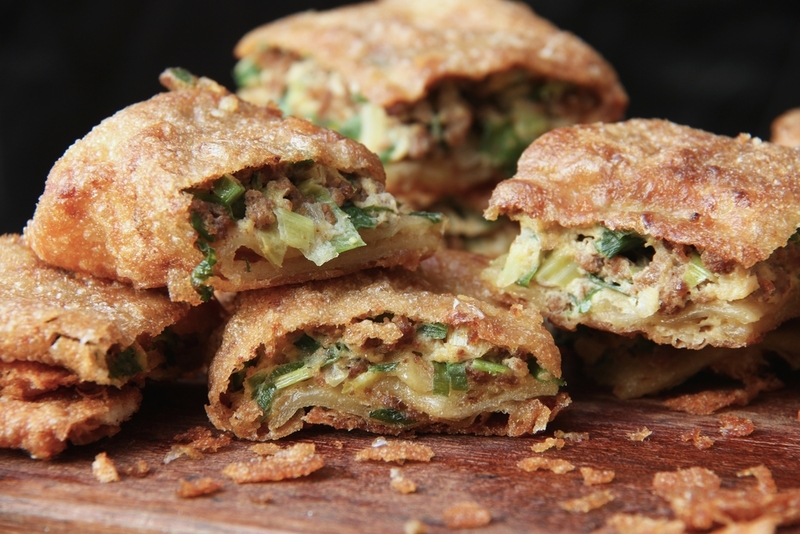 No trip to Bali is complete without trying Martabak, a stuffed, fried flatbread that can be eaten sweet or savoury. This delicious traditional street food can be found at stalls and night markets and is worth trying at least once during your trip. 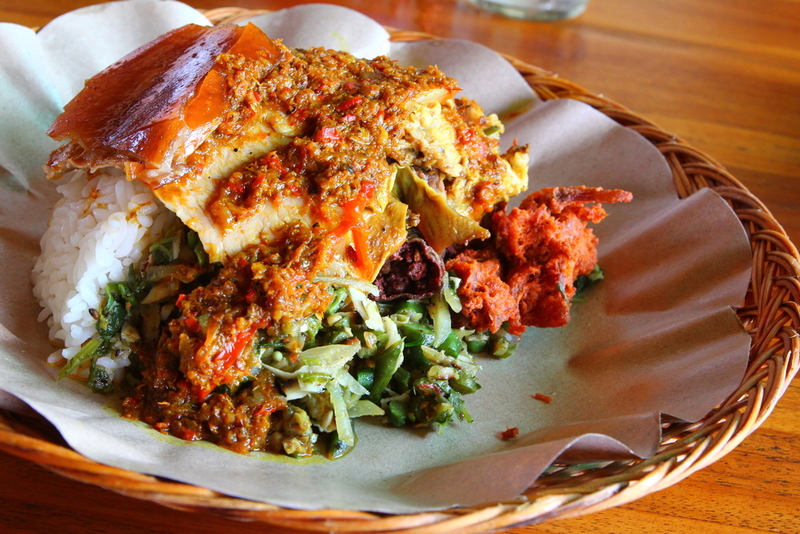 Ask for Martabak Telur for savoury bread filled with egg (and sometimes vegetables and meat). Martabak Manis is the sweet version and usually contains chocolate sprinkles, condensed milk, crushed peanuts and other toppings – yum! Martabak can be enjoyed sweet or savoury. One of the most popular Balinese dishes among travellers, sate is a crowd-pleaser for sure. 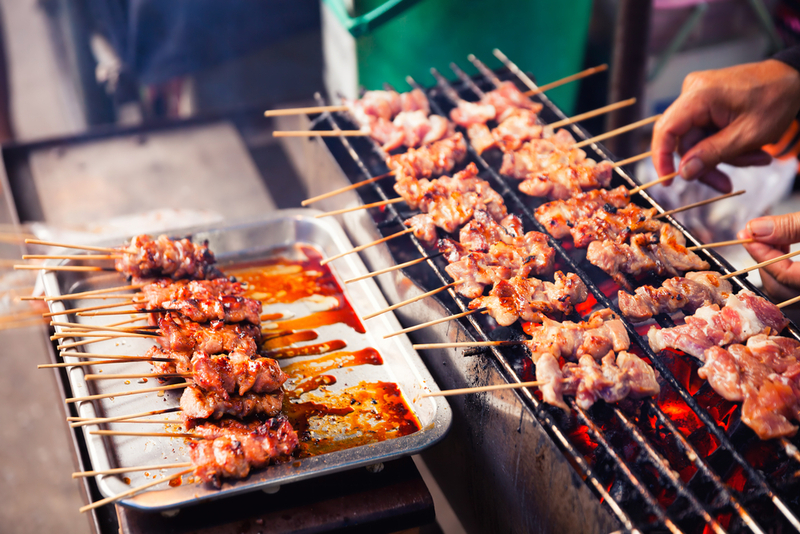 The world-famous and addictively-delicious Indonesian specialty is made from skewered, marinated meat (usually chicken) which is then grilled and served with peanut sauce. Sate is Bali’s most famous and most popular traditional dish. This roasted pig dish is one of Bali’s most famous and for good reason! Prepared with a rich blend of spices and seasonings (including ginger, galangal, turmeric and lemongrass) Babi Guling is packed with flavour. The meat is slow-roasted over a fire and the end result is melt-in-the-mouth delicious. 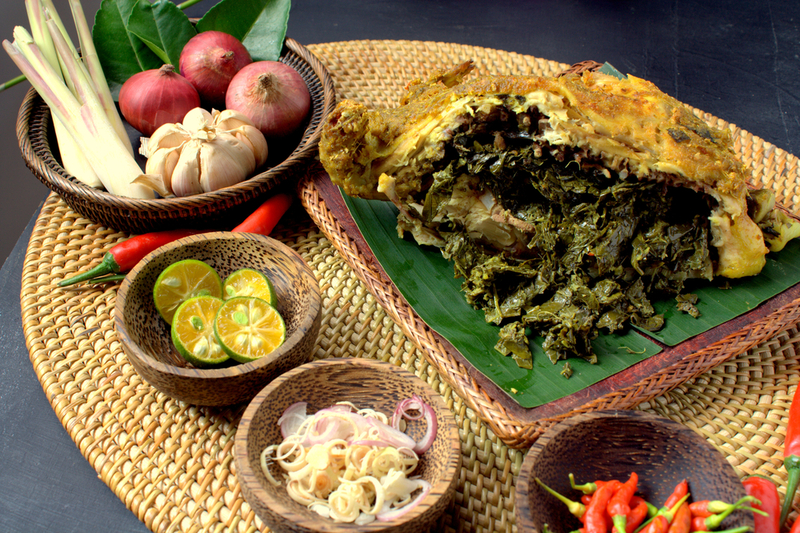 The traditional ceremonial dish, Babi Guling, is one of Bali’s most famous traditional meals. Bali’s best-known duck dish is another must-try for travellers on a culinary adventure. The bird is first stuffed with spices before being wrapped in a palm leaf and smoked, for an authentically delicious flavour. Bebek Betutu: Slow-cooked, smoked duck. If you need something to satisfy your sweet tooth, try Laklak while you’re in Bali. These little rice flour and coconut milk cakes are usually served with brown sugar and grated coconut, for a perfect mouthful every time. These little green cakes are an Indonesian favourite. To try the famous Balinese Bebek Betutu during your trip, dine at Warung Padang Kecag in Candidasa. Order the slow-roasted duck dish a few hours in advance to allow enough time for the dish to be prepared, before returning to enjoy the exquisite smoky flavour of the meat. If duck doesn’t excite you, they also serve a deliciously fresh seafood platter! Babi Guling is one of Bali’s most indulgent (and famous) traditional dishes and is a must-try if you’re on the quest for authentic culinary experiences. Warung Babi Guling & Kuah Balung Bu Dayu in Kuta is one of the best places on the island to try to dish. Head over for melt-in-the-mouth pork with outstanding flavour and a pocket-friendly price! For the freshest seafood you’ve ever tasted, shop for your dinner at the Jimbaran Fish Market. Located in the coastal area of Jimbaran, this thriving market opens its doors at sunrise every day. Head down early to get first pick of the days’ catch and take your haul to a local restaurant to have them cook it up the way you like it. 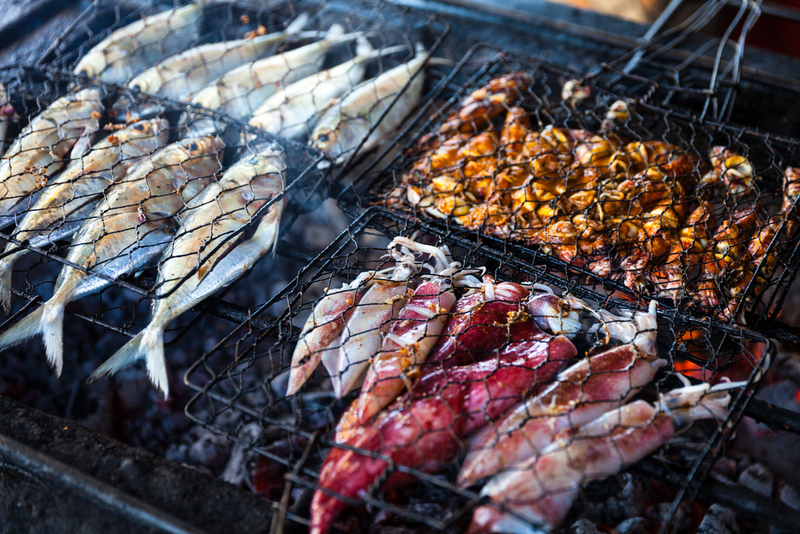 For the freshest seafood, buy your supper at the Jimbaran fish market. Are you dying to try Bali’s sensationally sweet dessert, Laklak? Check out local restaurant Warung Laklak Dah Lolet for traditionally made Laklak during your trip. 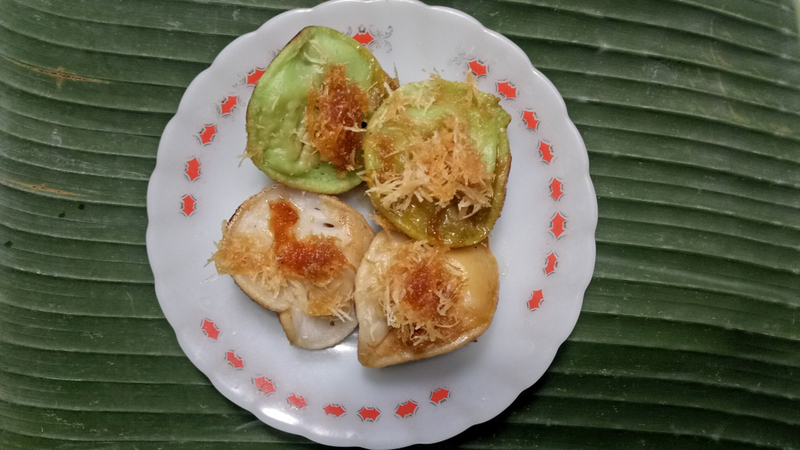 For a delicious and authentic taste of Bali, make sure you try these little green cakes! Sate is one of Indonesia’s most famous dishes, so you’ll almost certainly end up eating some while you’re in Bali. To get the best of the best, head to the Gourmet Sate House in Kuta! This Balinese-style restaurant serves some of the best sate on the island and is the perfect place to try Bali’s signature dish. Waroeng Bernadette is known for serving some of the best traditional Balinese food in Ubud, but their Beef Rendang is the star of the show. Spicy, rich and flavourful, this indulgent dish is a must-try for foodies in Bali.